Hello there friends and BoBunny Fans! 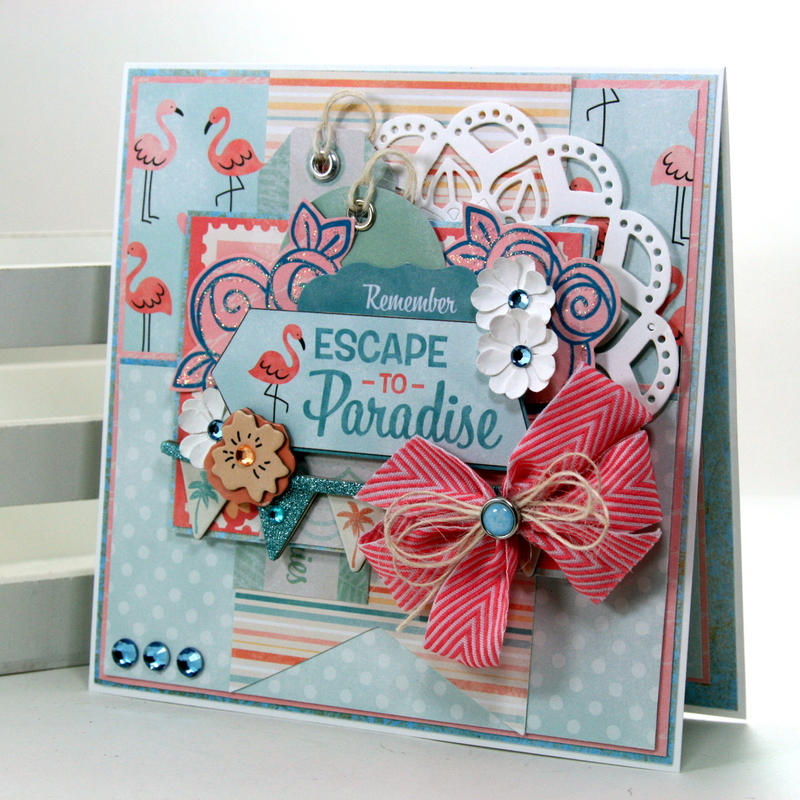 Ginny here dropping in to share the latest project I’ve created with Escape To Paradise. I’ve tucked in a few stamped images to this book cover for a very layered look. Coordinating flowers and Double Dot Jewels are the perfect finishing touch for this summer fun mini. The large cut apart sheet offers loads of images to use on tip ins. What a great way to maximize the real estate for an album. Pockets can hold tags of all shapes and sizes. This one comes form the NoteWorthy collection. 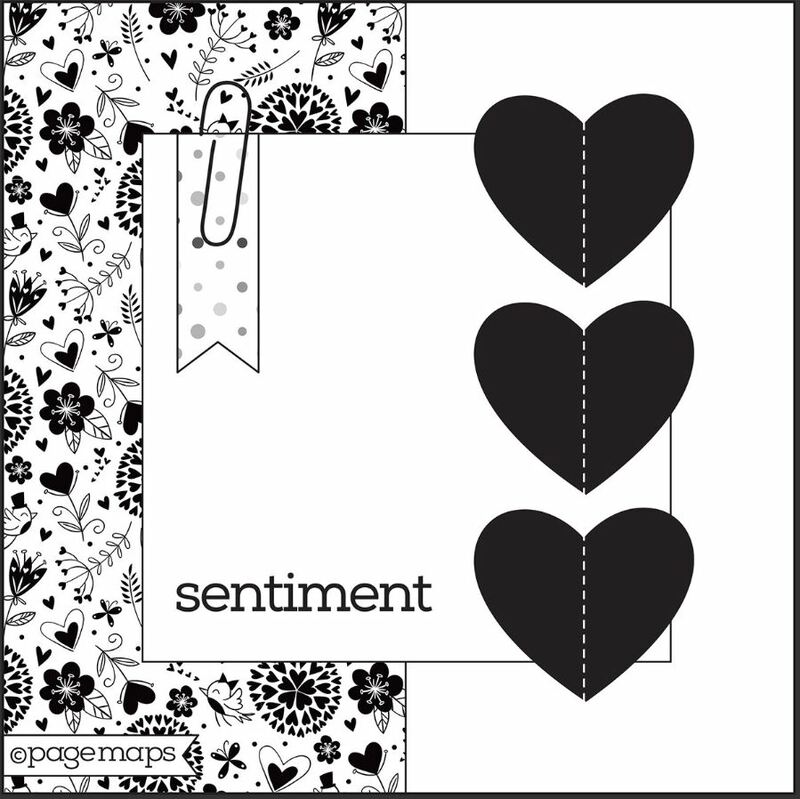 The sentiment on the pocket also comes from the top of the large lined tag image from the collection. 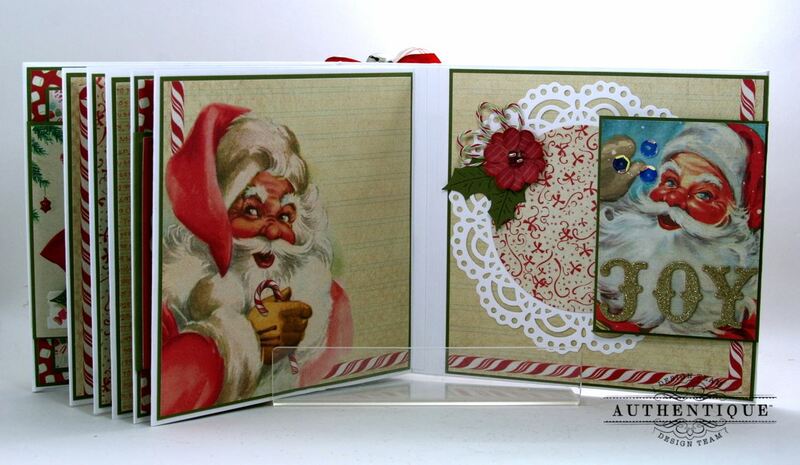 I used the Vicky Boutin inks and the BoBunny stamp to add interest and detail to this page. It’s creates such a pretty framed background for pictures or journaling. I stamped the sweet stylized flower image around the outside of the paper then while the ink was still wet I sprinkled on clear glossy embossing powder then heated it to set the images. Here’s another page with a pocket and tag. 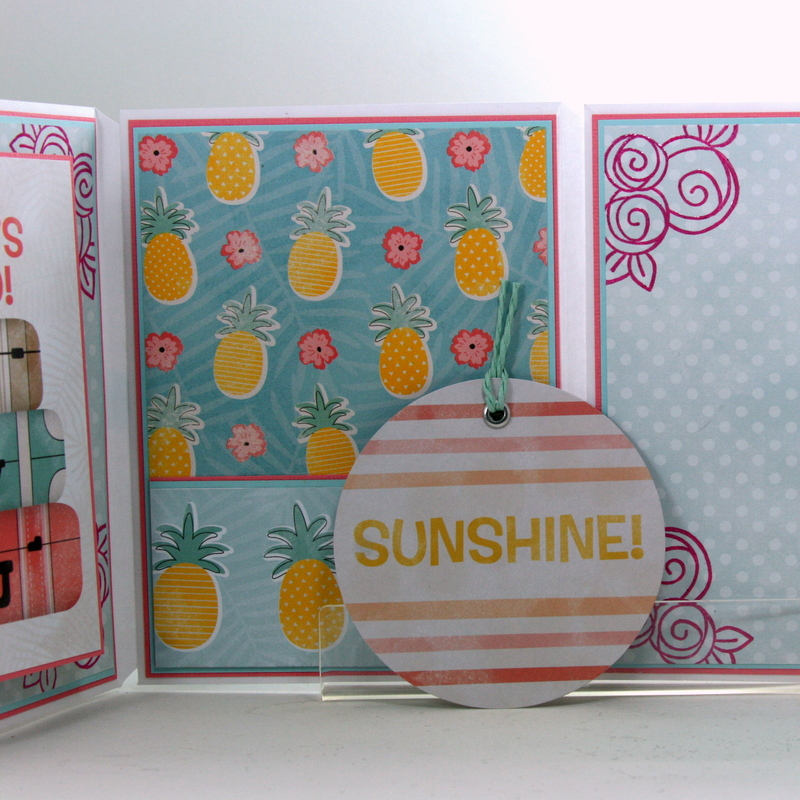 I used the pineapple border strip from the cut apart page to create the pocket and layered it over the smaller pineapple print patterned paper. The tags are finished with a metal eyelet and matching twine looped through. 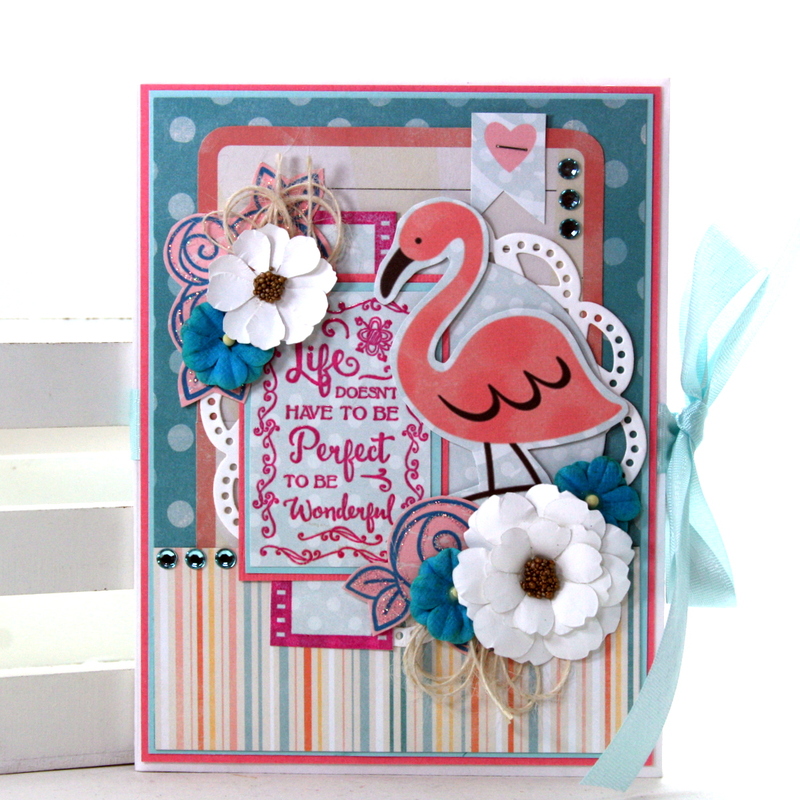 One more tip in here with a flamingo …the iconic image of summer. You can see more stamping on the page beneath. Hello there friends and crafty peeps! Dropping in with another dose of Christmas in July! So many projects to share and I’m running out of July : ( Is Christmas in August a thing? Seems like it should be. 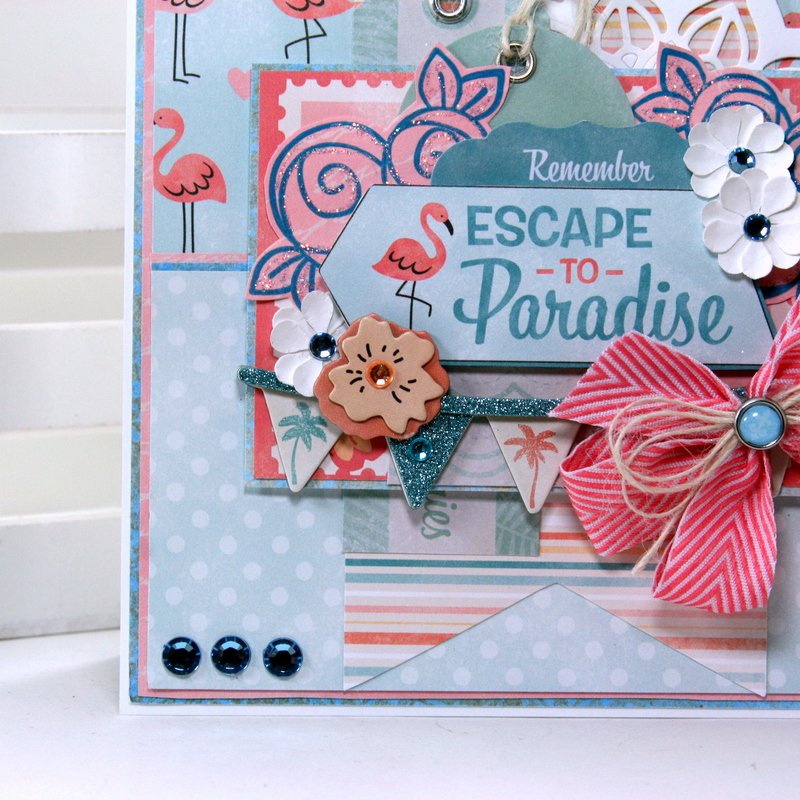 Today I’m sharing 2 tags created with the Have a Jolly Holiday Printable from my shop. I love the subway style and variety of sizes and themes. 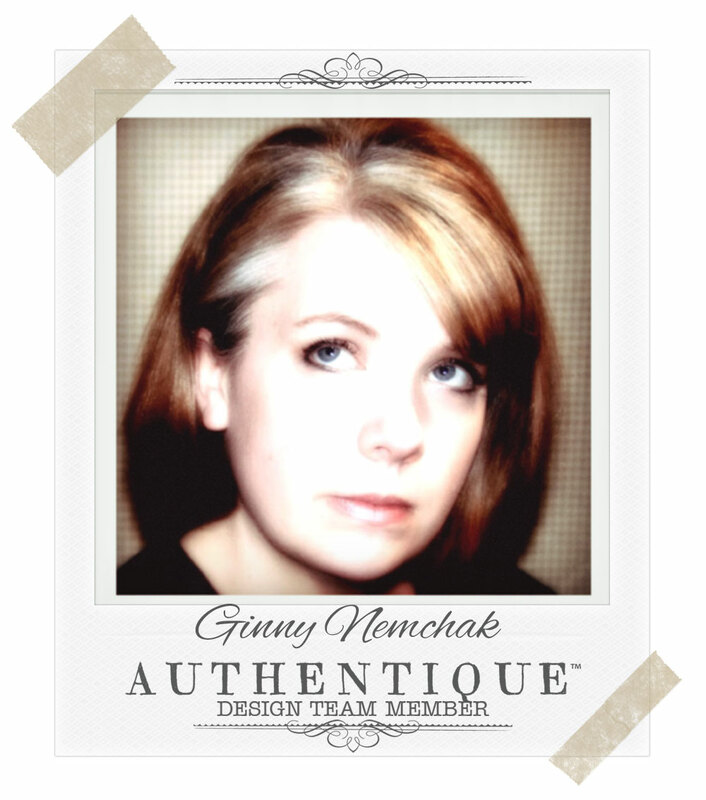 My first tag is in a woodland theme…. It’s color pallate is pulled from nature with loads of greenery and wood grain. I tucked in some altered chipboard to create a nice base for the flowers. Pretty coordinating blooms create a nice arrangement when layered over die cut foliage and loopy twine bows. Burlap ribbon is the perfect choice for this tag with it’s gorgeous texture and stitched center in matching green. My next tag is very traditional……. Oh how I love the combination of plaid and stripes! Here is a combination of hand crafted and ready made flowers along with velvety leaves, die cut pine boughs and holly. A few loopy bows and it’s a winter garden arrangement perfect for the holiday. The coordinating plaid bow at the top is the icing on the cake! I found this little gem of a reindeer sticker in my stash and layered it over a sweet Adirondack pattern then topped it with more of the festive blooms. 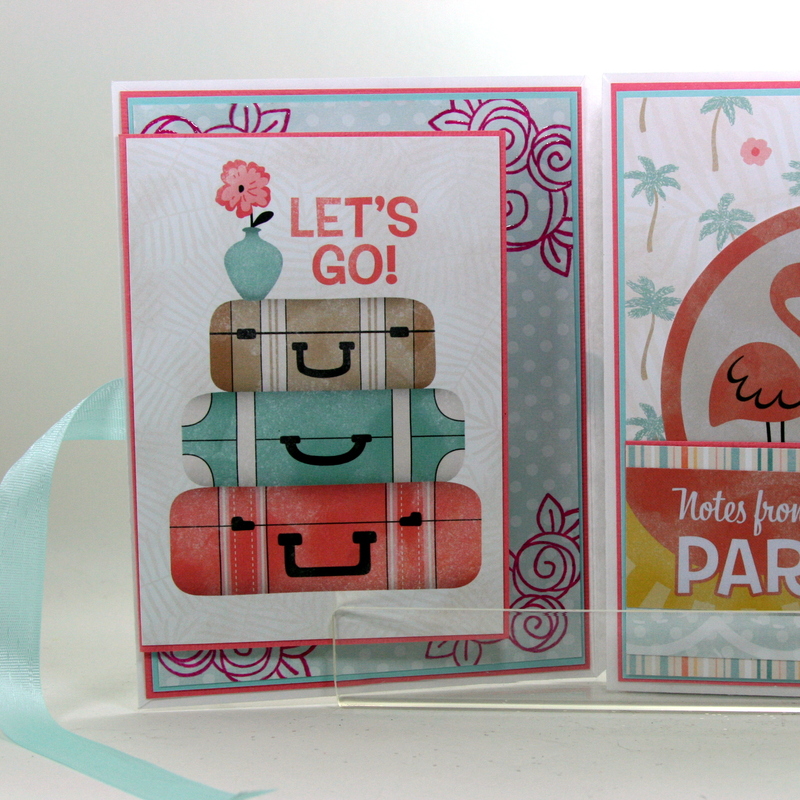 I hope you enjoyed seeing these two very different tags created with the same printable! Hello there friends and crafty peeps! 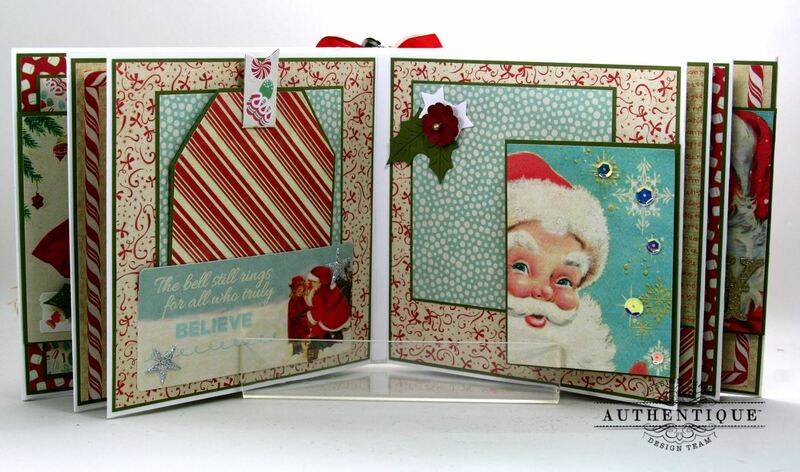 Today I’m sharing a project I created entirely out of scraps. Putting the dies to work today to create flowers and focal images. I didn’t get through much of the pile but hey every little bit helps! I feel like this falls into the Mountain Chic theme. Is that even a thing or did I just make it up? I think what makes it mountainy is the moose and the buffalo plaid. Of course every Polly’s Paper Studio project has to have trims and bows. Even if it has a moose on it! 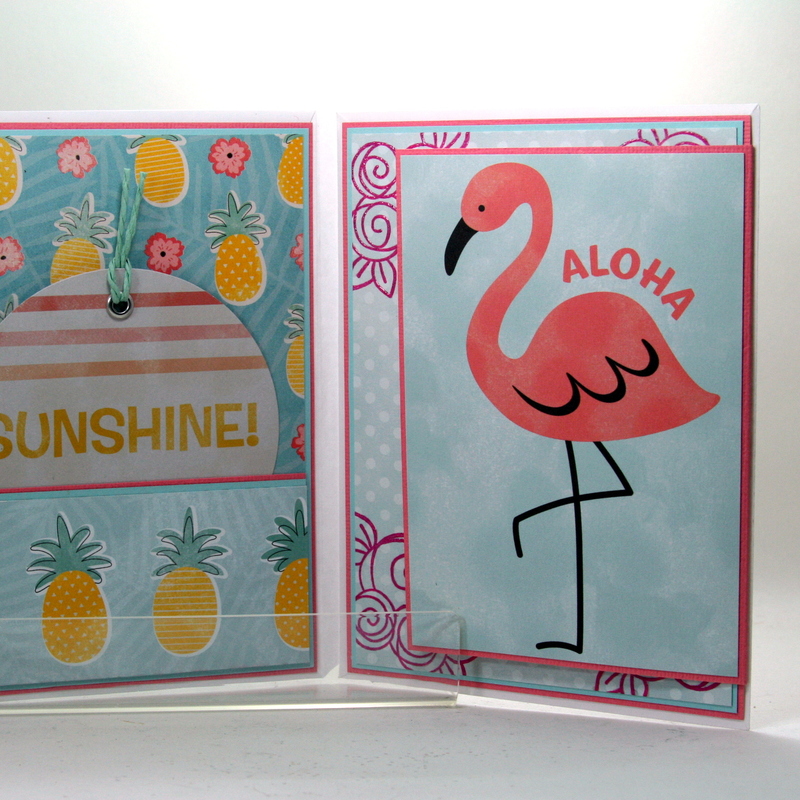 All of these fun embellies were created using dies. Topped off with a bit of prills and Stickles I think they look fabulous. 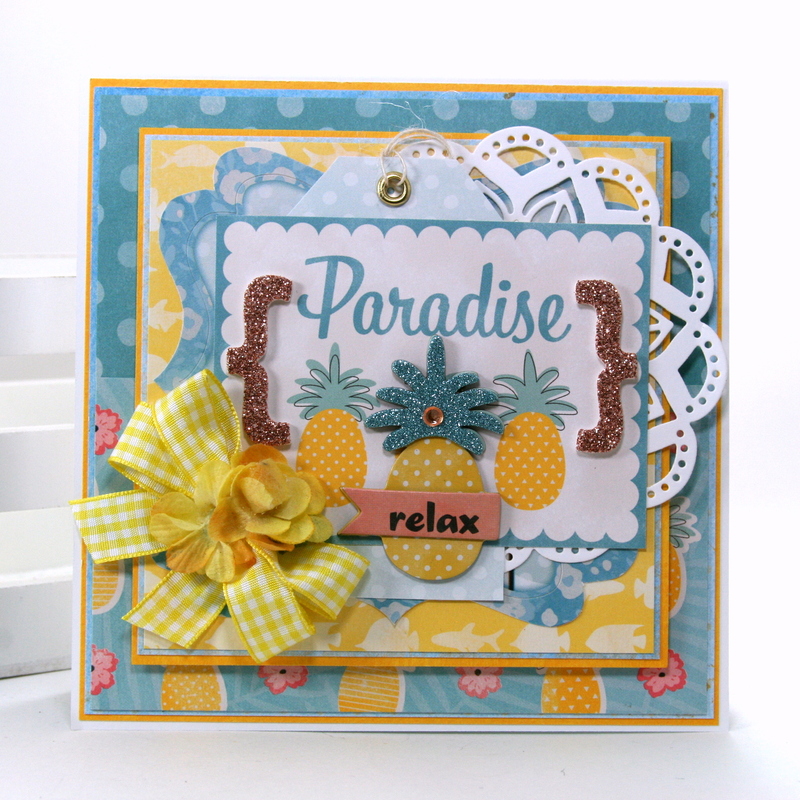 Please enjoy this video tutorial I’ve created for this tag…. 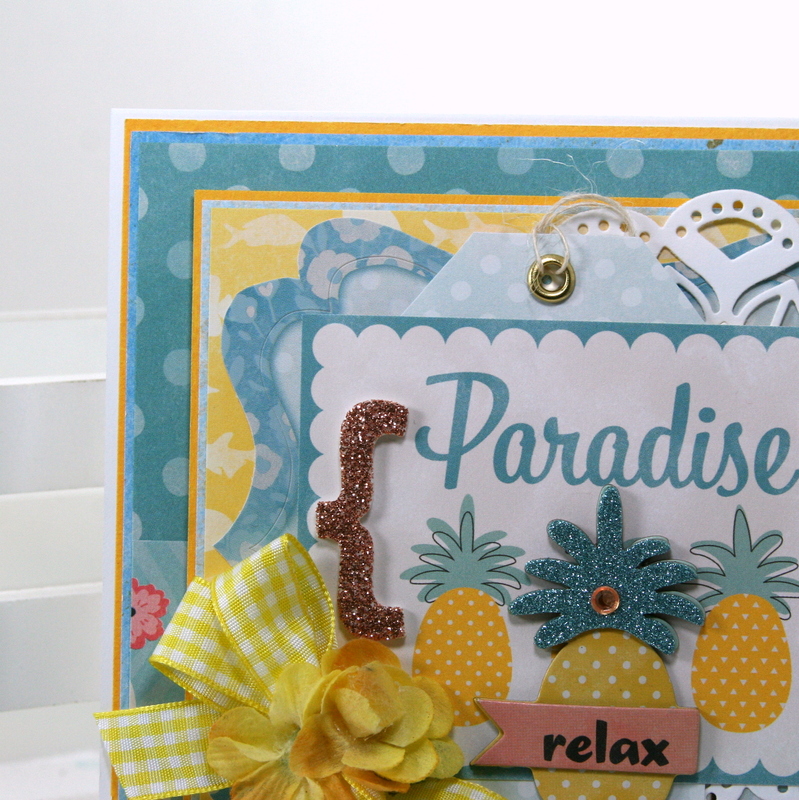 You can find loads of crafty holiday inspiration on our Polly’s Paper Studio YouTube Channel. Really Reasonable Ribbon~Black Plaid Ribbon, Francis White Crocheted Lace. Hello there friends and crafty peeps! Whose ready for more Christmas in July? This girl! 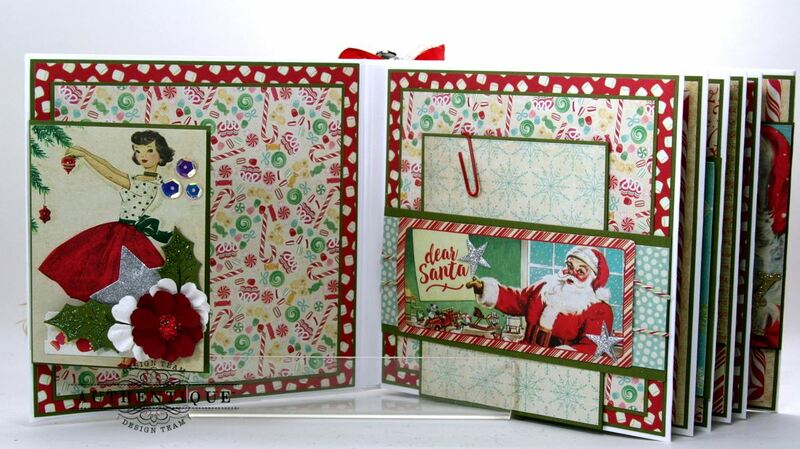 Today I’m sharing 2 cards that I created using our Winter Birds Christmas Tags printable. They have a similar layout but I changed up the collections so they are still very unique! 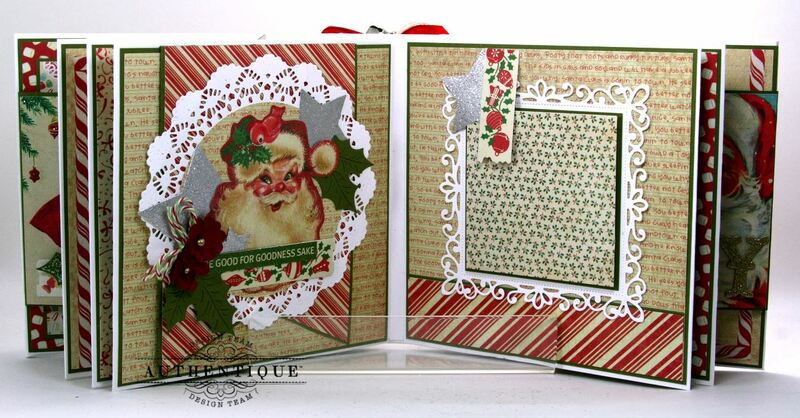 For this card I chose a very traditional color scheme with red and green. Red cardstock matting keeps the patterns from being too busy. I was able to tuck in just a bit of plaid since this is my fav Christmas pattern. 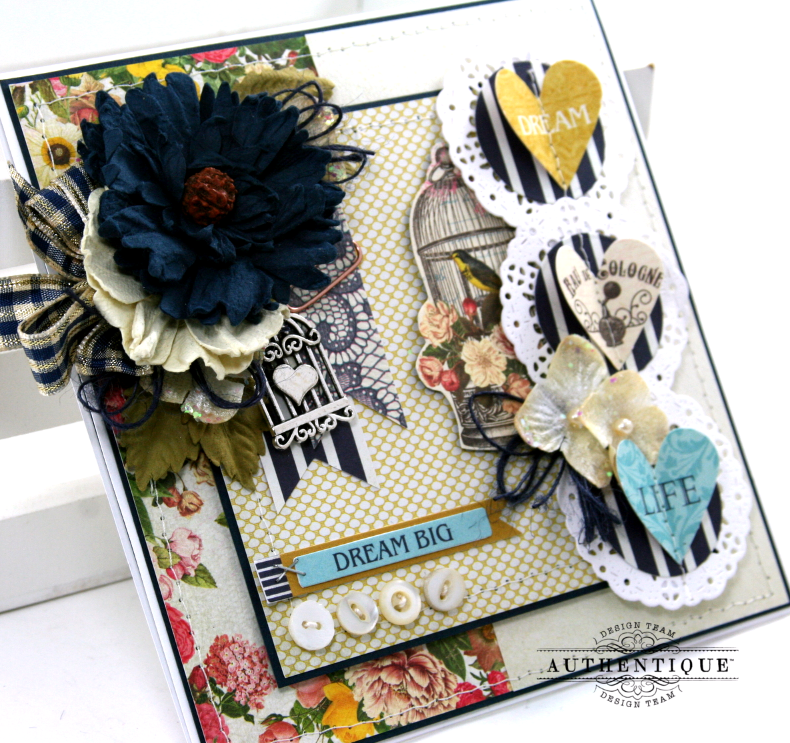 These flowers are handcrafted and layered with additional die cuts to fill in the arrangement. A pretty little bow topped with twine and a vintage button balance this corner. I’ve also added a tiny word sentiment and some pearly bling. 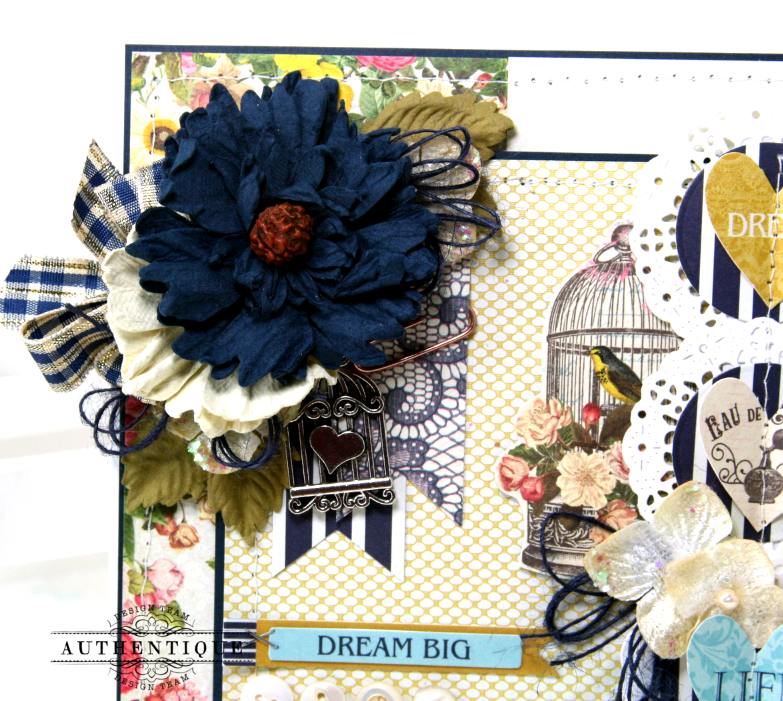 This card has a similar layout but using tones in soft blues to give this card a much more vintagy look. I’m using the same Winter Bird Christmas Tags printable and chose one to coordinate with the patterned papers. 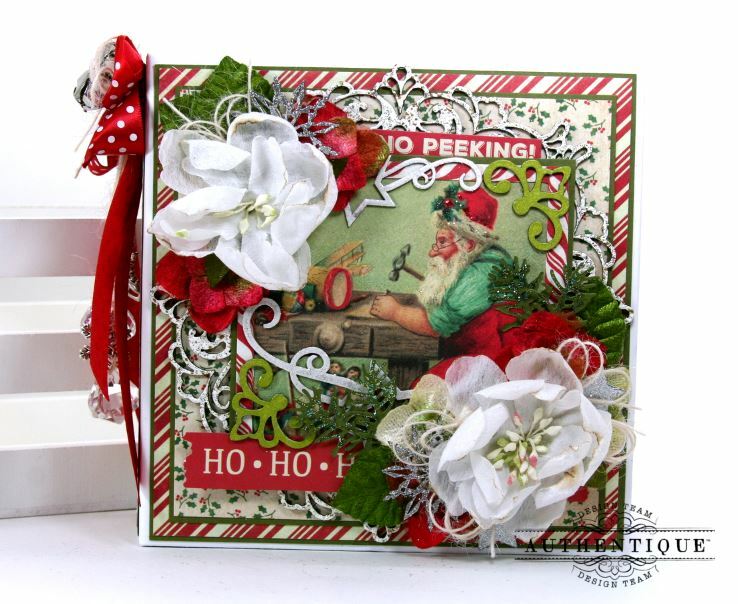 There’s a small oval wreath die cut layered over a larger doily die cut to create a nice background. These amazing flowers are from Little Birdie Crafts. 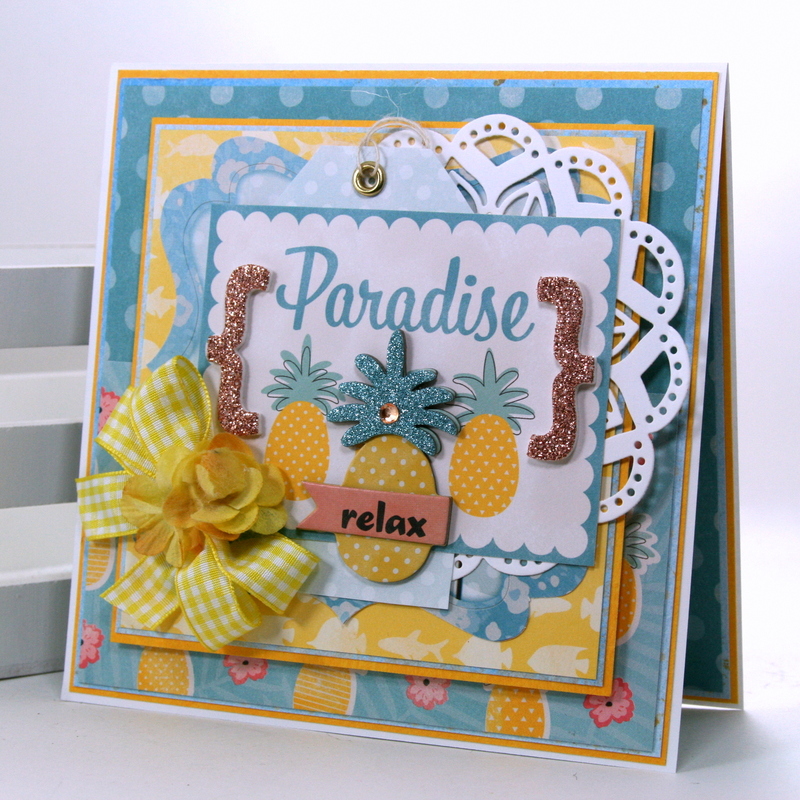 The crackle pattern reveals a gorgeous gold which really adds to the vintagy look of this card. 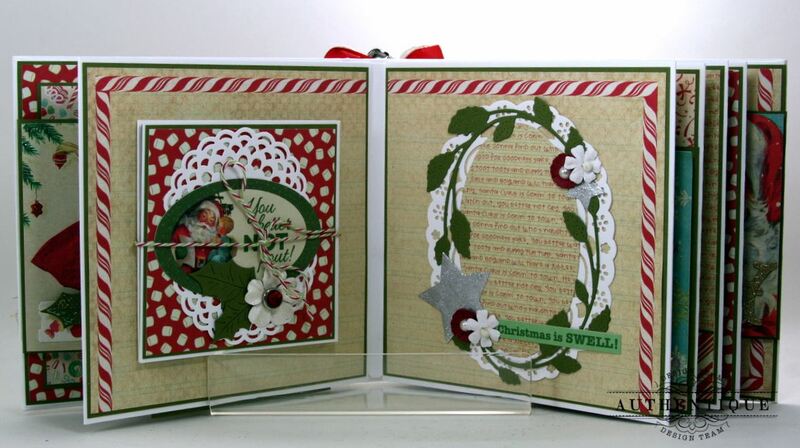 I used the same foliage die cuts as a base but leaned more toward the whites to keep the arrangement lighter. Pretty satin bow with twine and button. 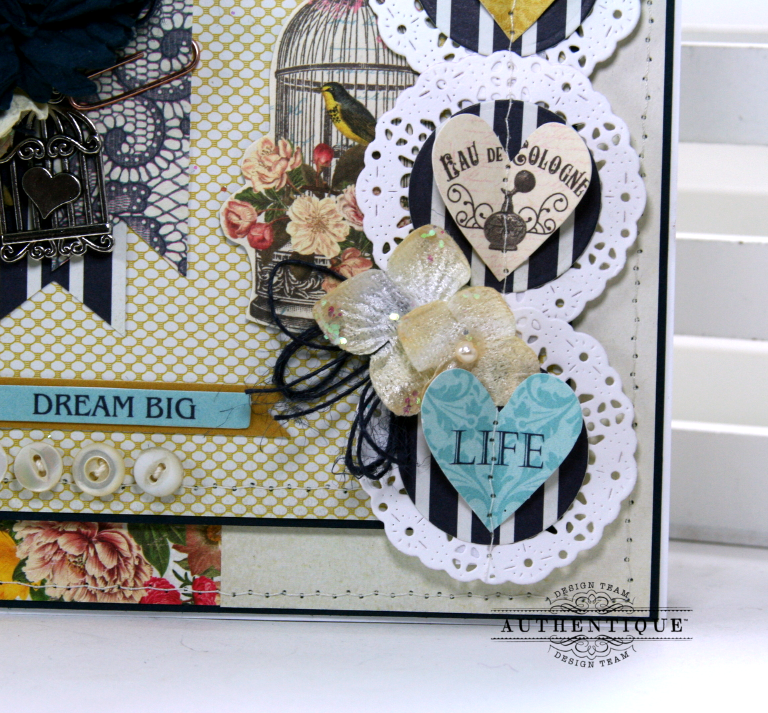 One more tiny word sentiment and pearls and this card is complete! Really Reasonable Ribbon~Square in Square Kiwi Green, Stitched Satin Aqua, Ivory Burlap String. 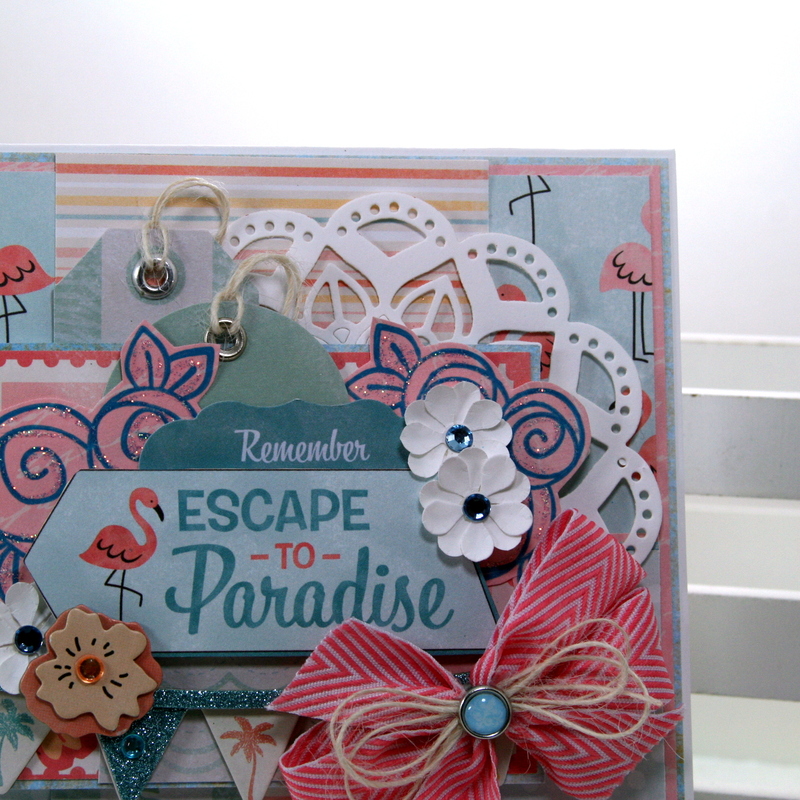 It’s time to share my first project created with the amazing Escape to Paradise collection. 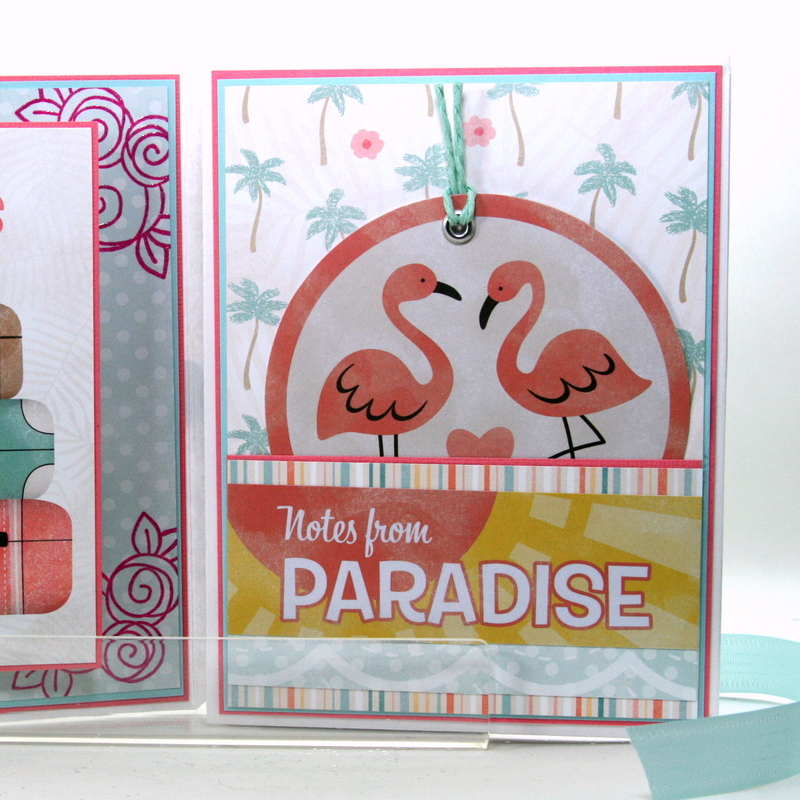 If you can picture vintage Miami deco retro….that would be this collection. So much fun! And the bright cheery color scheme is really winning me over. 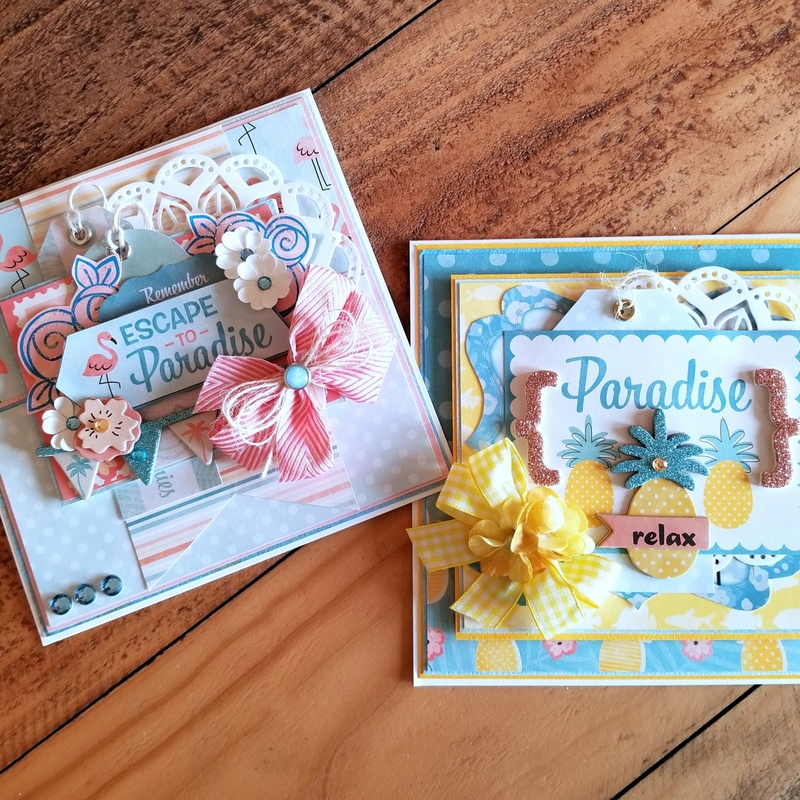 I created two very different cards just to show the versatility of the patterns. 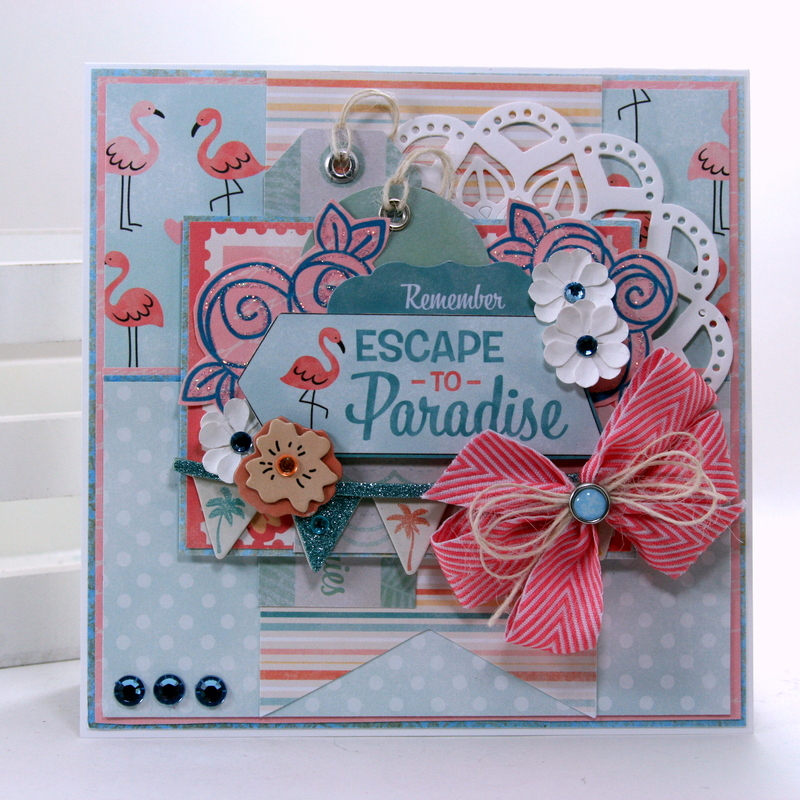 This card was such fun to create. I don’t know why I don’t work with yellow more often. I guess because I need more pineapples in my craft stash lol. I created a double layer of matting with the Double Dot Cardstock and I think it really helps the colors pop. 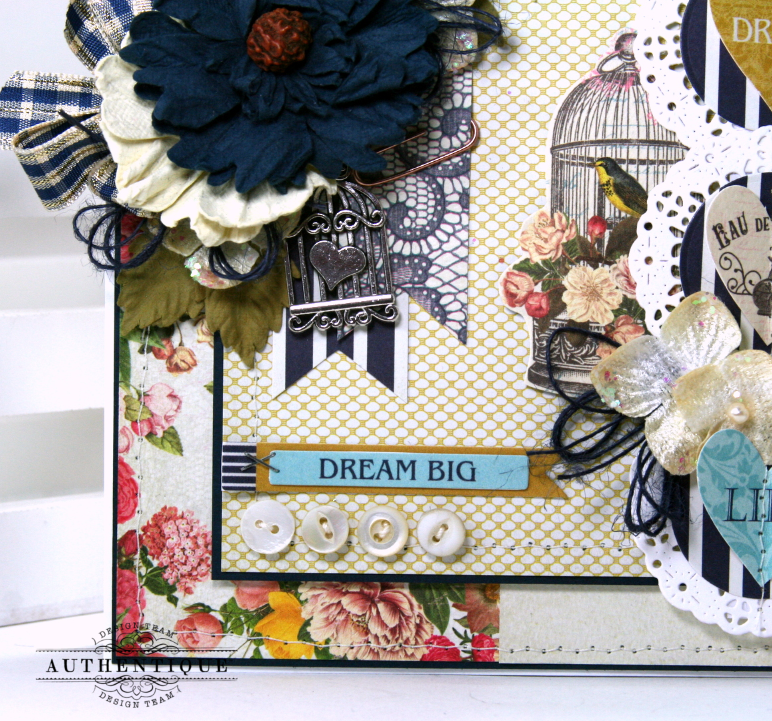 There’s a tag tucked into the layers and a die cut doily. On top I added some thickers for a bit of unexpected sparkle. I used the giant sticker from the combo sticker sheet to act as a base for all the layers. 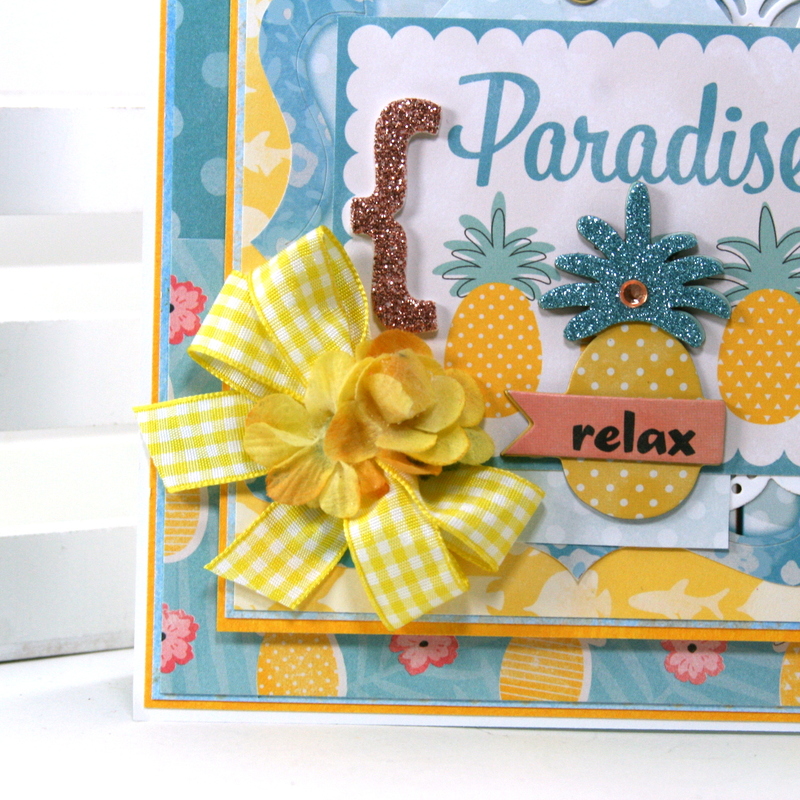 Even though this cut apart has 3 pineapples already printed on it I added the one from the Layered Stickers too because I liked the sentiment and the bling. A simple bow with a few flowers was all this card need to be finished off perfectly. 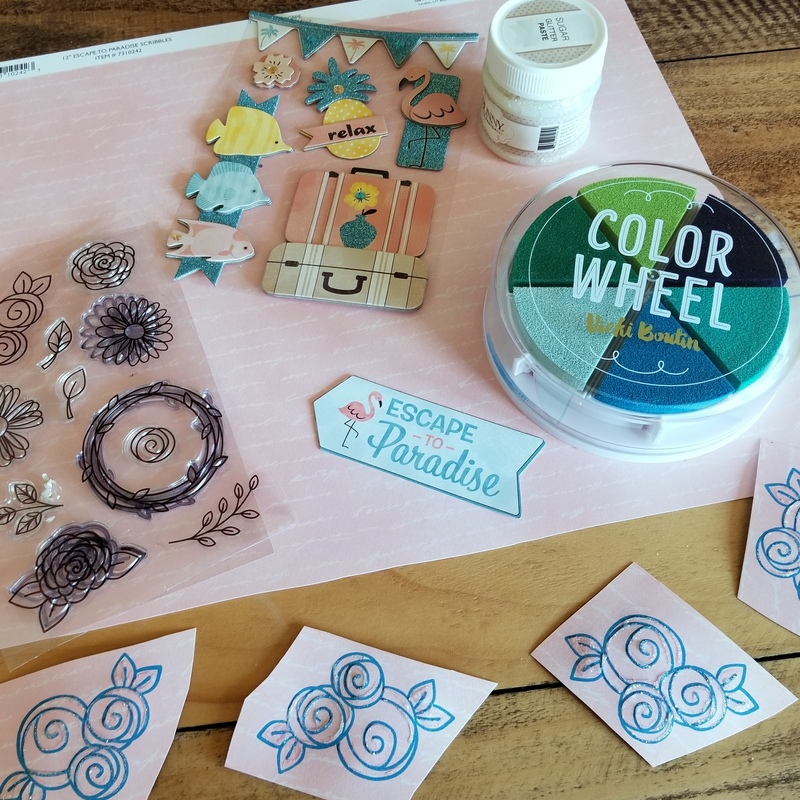 For my second card, I wanted to create some of the embellishments with the new BoBunny Stamps and the Vicki Boutin Color Wheel ink pad. The doodly flowers work so well with this collection! 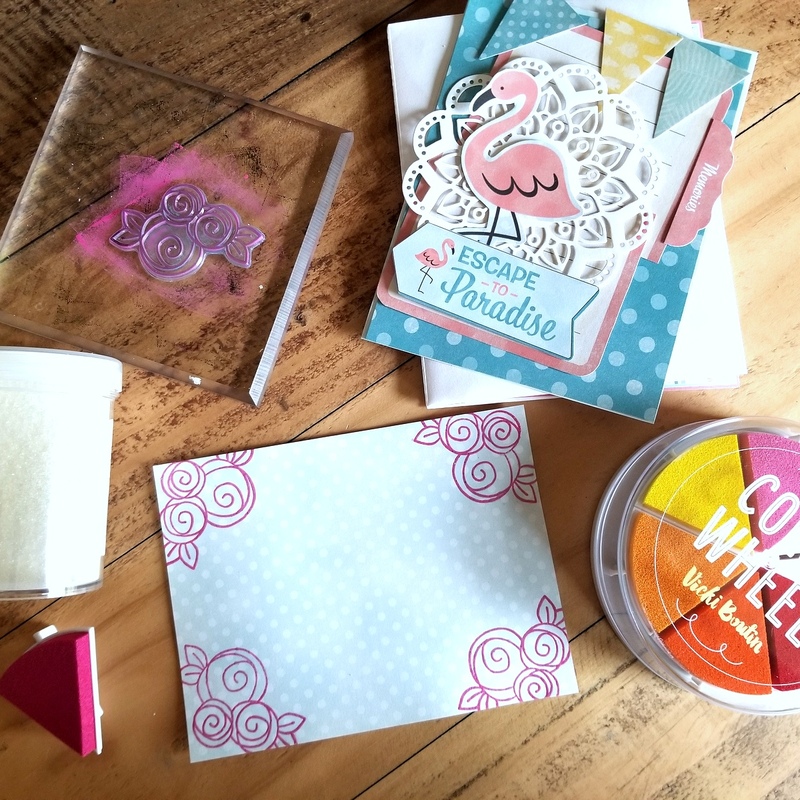 They are stamped onto the patterned paper then after drying given a bit of detail with the Sugar Glitter Paste. Leaving a small border around the outside when cutting them out gives these made by me flowers a purchased embellishment quality. So. Many. Layers. I mean can you ever have too many layers of gorgeous BoBunny papers? I think not! I’m really loving those stamped flowers and they were super easy to tuck into the layers. I’ve topped them off with a few additional made by me flowers and one from the layered sticker sheet. The Mandala doily is one of my favorite dies as it’s got a simple and not too intricate shape. Of course I added a poofy bow. This one is topped off with a second bow of loopy twine and a Double Dot Brad. The tags in the back come from the Noteworthy collection and were finished with a simple eyelet and twine pulled through. The Double Dot Jelwels coordinate perfectly with the Layered Sticker banner. How did I get this far without mentioning the flamingos? This may actually be my very first flamingo project. I’m trying to recall but I can’t think of one. Even though these cards come from the same collection they are very uniquely different. I love them both! Hello there friends and crafty peeps! 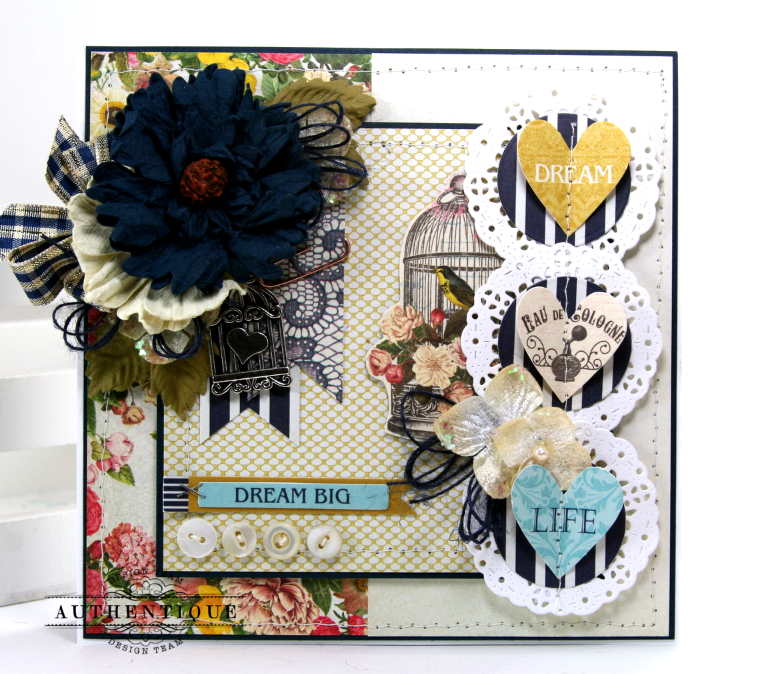 This month the folks at Authentique are teaming up with PageMaps and it’s my turn to share the card I created with the inspiration of this fabby card sketch. 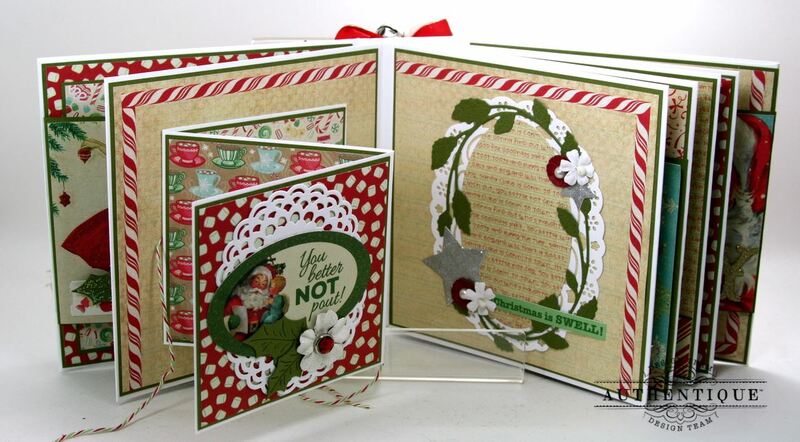 I’m using the gorgeous Dame Collection for this card as well as some perfectly coordinating embellishments! 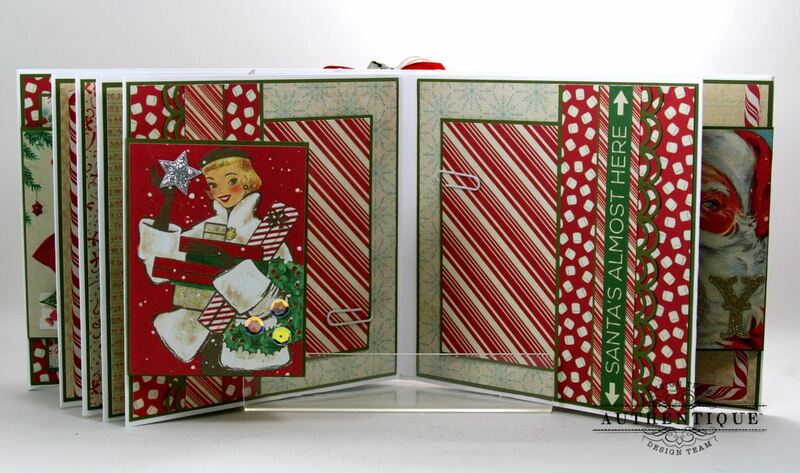 I’m really a big fan of square cards so I was so happy to receive this sketch to work with. 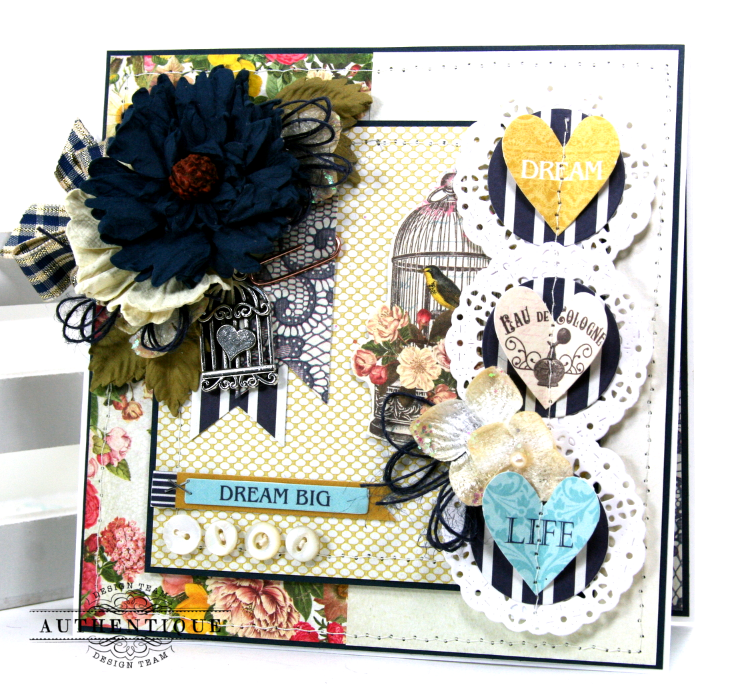 The Dame collection has so many gorgeous elements to play with that it’s a favorite for me to create cards with. Following along with the sketch I layered on the paper patterns. Some from the 12 x 12 sheets and some from the 6 x 6 paper pad. A bit of stitching adds nice texture and a subtle detail. I’ve incorporated a few vintage buttons and a sentiment from the sticker sheet. A few additional flowers and a smaller bow of loopy twine helps to bring the balance from the larger arrangement. 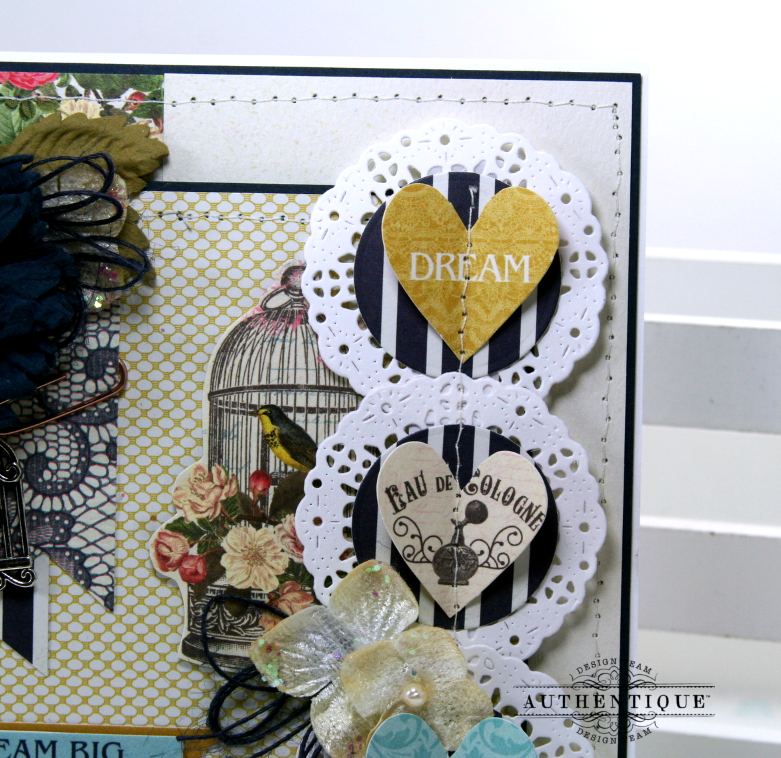 I’ve also added a fussy cut birdcage to continue the bird theme from the charm.